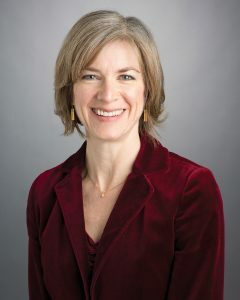 Jennifer Doudna ’85 tells the tale of one of the greatest scientific discoveries of our time—and of the huge ethical dilemmas that followed. Biochemist and UC Berkeley Professor Jennifer Doudna ’85 and her team discovered CRISPR-Cas9, a game-changing gene-editing technique with tremendous possibilities for curing diseases of all kinds, thanks to its precision. But with that finding, Doudna (who is also a Pomona trustee) discovered something else—that a great revelation sometimes brings with it a lot of wrestling. In A Crack in Creation, she tells a story that is about both success and struggle. 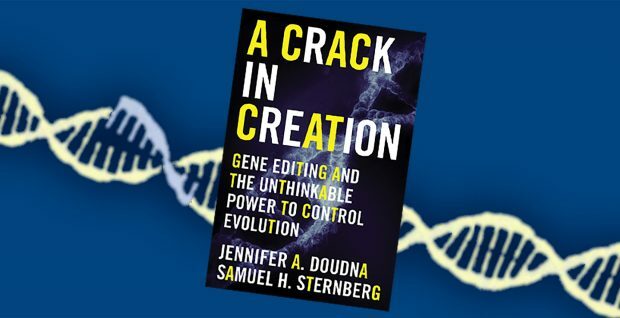 PCM Book Editor Sneha Abraham talked to Doudna about the implications of what might be the most revolutionary scientific breakthrough of our time. This interview has been edited and condensed for space and clarity. PCM: You say in your book that, as a research scientist, you need adventurousness, curiosity, instinct, grit, practicality. Where do you get these traits from, and who’s your greatest influence? Doudna: I think it comes from a combination of innate curiosity—I think we all have it, certainly as kids—and appropriate encouragement from family, friends and mentors along the way. That mix gave me an open-mindedness to ideas and a way of figuring out how to ask questions about the natural world. PCM: Did your Pomona education prepare you for this in some way? Doudna: I am grateful to Pomona every day, honestly, because it was a liberal arts education that exposed me to so many ideas that I would never have come into contact with, probably, without having attended Pomona. Many smart people, lots of really bright students, and not only those interested in chemistry, as I was, but also people thinking about history, French, physics, mathematics and geography. All sorts of topics. It’s a rich intellectual environment that opens one’s mind to the incredibly interesting diversity of the world in terms of cultures, ideas and perspectives. PCM: Was there a class or professor that really impacted you while you were here? Doudna: I think [Professor of Chemistry] Fred Grieman. I know he’s retiring soon, but Fred Grieman was a newish professor at the time when I attended Pomona. He was teaching physical chemistry, and he was spectacular. I think he’s a great combination of really deep understanding of the material so that you could teach it in a very clear and comprehensible way—and it’s not an easy topic, as you know—but also somebody who was very human, very funny, great sense of humor, really great at connecting with students. We used to play softball together in the summertime, and he always had students working in his lab over the summer and would have barbecues and things like that. He was very good at teaching us students that you could be a terrific scientist, very smart and intellectual, and still have a life outside of the lab. PCM: In the book, you talk about that moment of discovery, that moment of pure joy in your kitchen. What was that like for you? Doudna: Well, I’ve had a few, I would say, such moments in my career, and in this case, it was really one of those rare times in one’s life when the stars align. In our case, the ideas had come together, the data for experiments we were working on in the laboratory had given rise to a really sudden understanding of, not only how the CRISPR bacterial immune system works, but also how it could be used in a really exciting way. And that night, that moment I describe in the book, was really one of just unadulterated joy thinking about how amazing it is to explore science and make a discovery that you realize is going to be really impactful and change the world in certain ways. PCM: That discovery presents so many amazing possibilities Was there an immediate thought that came to mind? Doudna: For me, it was probably thinking about opportunities to cure genetic disease. When I was in graduate school in the 1980s, my lab was located at the Massachusetts General Hospital, where a professor named Jim Gusella was mapping the gene that causes Huntington’s disease. It is a terrible neurodegenerative disease that people get usually in their 20s, 30s, 40s, and then suffer from for many years with progressive loss of neurological function. So, being aware of that gene mapping experiment that was done in the ’80s, and then fast-forwarding a couple of decades and realizing that CRISPR technology, in principle, will allow the correction of that kind of mutation was a really profound thought. PCM: You’re a research scientist, but with this discovery, you’ve become an ethicist as well, right? Were you expecting that as this was unfolding? How has that unfolding been for you? Doudna: Not at all. I was absolutely not thinking, originally, about the kinds of ethical challenges that would come up. However, it became clear over the ensuing months that CRISPR was working better than anticipated, opening game-changing opportunities in how we might treat existing patients and how the technology might help future generations. What would be the ethical impact and what would go into making the right society and species-defining decisions needed to be explored and debated. I went from being a biochemist and structural biologist, working in my lab on this esoteric bacterial system, to realizing that I needed to get up to speed quickly on how other kinds of technologies that have been transformative had been managed and handled by the scientists that were involved in their genesis. Because the field of CRISPR was moving so quickly, the ethical discussions needed to catch up. PCM: This is a big question. Is there an ethical dilemma that you’re most concerned about with genome editing? Doudna: Well, there are a few that have gotten a lot of media attention. I think I would say that, at least in the near term, what I worry about the most is a rush to apply genome editing in ways that might inadvertently harm people. That might be because of over-excitement or the desire on the part of a scientist somewhere to do something first. I think that competitive want to move ahead with new ideas can be a very healthy drive in science but it can also lead to problems. In this case, I really hope that there is a concerted effort globally to restrain ourselves and do things in a measured and thoughtful fashion that doesn’t get ahead of the technology and the ethical debate. PCM: It raises a lot of questions about us as a society, right? In the book you write about some of the implications socioeconomically and politically. How do you see this unfolding for the good? What are the dilemmas there? Doudna: That’s another really big question. The good news is that there are now lots of discussions happening about the ethics and appropriate uses of gene editing technologies. I think that’s great progress but how we ultimately deploy CRISPR is going to come down to the pace at which helpful applications are actually developed and approved for use. For example, one of the most promising applications is called “gene drive.” It is the ability to drive a trait through a population very quickly using gene editing. Gene drive could be a real environmental impact concern due to its potential to wipe out a species of mosquitoes and perhaps cause unknown damage to associated species and ecosystems. On the other hand, if deployed correctly, gene drive could have a hugely positive impact on human health by preventing the spread of mosquito-borne disease, perhaps by adding a trait that made mosquitoes incapable of transmitting a particular disease such as Zika virus. This is the type of cost-benefit calculation that has to be made in each case. PCM: With CRISPR, when you’re looking ahead, or maybe it’s happening now, what kind of effects do you see on the biomedical industry or pharmaceutical companies, or the health care industry? Because this will change a lot of how we do medicine, right? Doudna: I think it will in a few ways. One effect is using genome editing to discover genetic causes of disease. I think that’s still a very big data opportunity, to figure out, not only single genes that might cause disease, but also genetic interactions. Where there might be genes that interact with others to create a risk for certain people that bear that particular genetic makeup. I think that’s important, and it leads to opportunities to target those genes with drugs, and drug companies are increasingly using CRISPR technology to do exactly that. We are also trying to mine the human genome for new potential targets and then use genome editing to correct those mutations or create, if not a cure, at least some kind of a palliative approach to genetic disease. I think that will happen increasingly, especially as challenges like how to deliver these molecules into cells are addressed. I also want to mention the incredible commercial opportunities. I’m seeing a lot of young entrepreneurs starting their own companies focused on making use of CRISPR technologies, investors excited to contribute money, and growing opportunities for companies to partner in different areas ranging from biomedicine to agriculture. It is very exciting and these opportunities are not just for scientists, but also for people that have a variety of backgrounds such as business. It’s really an interesting convergence of young people with a mix of expertise. PCM: You write a bit about food politics, and the issue of GMOs, and that gap between the scientific community and the public. What do you think is driving the narrative that you say is false, that GMOs are a danger to our health? What’s behind that narrative that’s being pushed by other people? Doudna: I think it’s a couple of things. Partly, it’s a lack of understanding about what we mean when we say “genetic modification,” and the fact that essentially all the food that we eat is genetically modified, because it’s edited by plant breeders that introduce genetic mutations. You just have to reference back to what tomatoes looked like before plant breeders got involved. They were very different from how they are today but why is that? Well, changes to the DNA, of course, but those changes were introduced, not by a precision genome editing technology like CRISPR. They were introduced by random mutation and then selection for desired traits. So, the unknown that can worry the public is what other genetic changes come along to the ride? We know they do but we just don’t happen to know what they are. I think when people understand that, they start to realize that the whole definition of GMOs is a bit contrived. Also, I think the public can be suspicious about the intentions of corporations. That perception that corporations do not have our best health interests in mind, that they are out to make money, and that they do not care about potential risks, choosing instead to forge ahead with “Frankenfoods” or whatever you want to call it. We have seen this in the media, and it’s potentially at the expense of people’s health. It really comes down to those two things then — not understanding what genetic modification really means and how our current food supply was created by plant breeders, and also being suspicious of the real motivations of corporations. We need to take a step back and really ask ourselves, “What makes sense here?” Then, we need to take a thoughtful path forward that allows technology to advance and help us solve important challenges in a way that is responsible. It’s not an easy balance, but I think we have to try to tackle that. PCM: So who decides how this technology is used? You talk about that being a dilemma, as well, between scientists and the public. How is that dialogue going, currently, and how do you see that developing? Doudna: Right now, the way that science progresses is largely decided by scientists, and then there are funders. So, if the scientists have an idea, something they want to do in the lab, they have to get money to do it. If they’re getting money from the public, namely from the taxpayers, that involves typically writing a grant, writing a proposal that says, “Here’s the science that I want to do, and here’s why,” and submitting it to a review committee of peers who review and comment on it. For example, they may say, “Well, good idea,” or, “Not a great idea,” and they then make a recommendation to the government about whether that type of science should be funded. That is how it currently works. Now, if you’re a scientist who has other kinds of resources that are from private money—you have a wealthy donor or a foundation—you have to convince those folks rather than representatives of the government. Either way it usually comes down to an idea on the part of the scientist, and then convincing somebody or some entity to pay the bills. There’s a lot of science that involves things that could cause risk to humans. There are various kinds of regulatory controls that are placed on that work and various kinds of panels or review boards approve those kinds of projects. However, there’s not a broader oversight other than that, and a number of scientists have commented upon the fact that, for example, institutional review boards, or IRBs, have rules for how researchers can do things like work with human subjects or human tissues. The issue is that the rules are different at every institution. Since the IRB rules at my institution, UC Berkeley, are different than other universities, I could have colleagues working elsewhere that would be under a different set of rules. That’s something that various groups are looking at—ways to try to streamline. As you can imagine, it’s very tough because you have a lot of different people with different opinions about these sorts of things. So, it’s just an ongoing challenge that we have. Doudna: Wow. That sounds very ambitious. It’ll take a lot of work to not have to work. That’s all I can say. PCM: It’s not in the immediate future?